Because of it's rather search-unfriendly generic name, information for the dialog program, i.e. this: http://linuxcommand.org/images/adventur … ialog1.png , is just a bit difficult to come by, so hopefully someone here has experience with dialog and knows the answers to my question that Google seems to guard closely. but I can't seem to find a setting for dialog. In the same vein, (a menu) (or would this be a capillary?) is there a setting to make the menu automatically resize to the entries passed, rather than having to manually define the box sizes? I don't believe there is a way to get a single key press in a menu. But why use dialog for this at all of this is what you want? 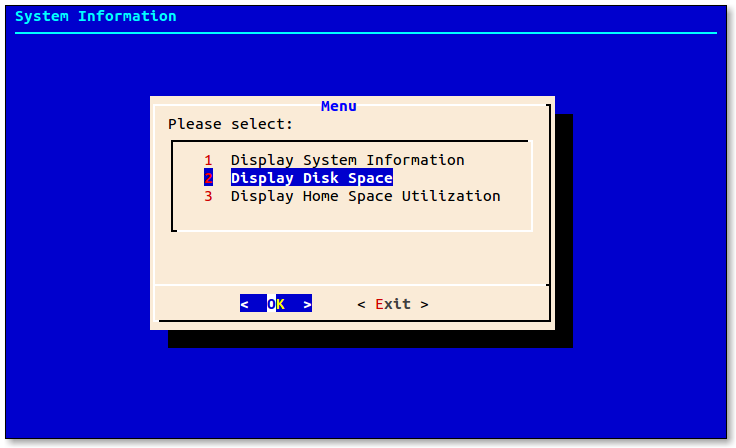 · If the parameter is zero, dialog uses minimum size for the widget to display the prompt and data. Your first Q. I second Trilby on that one, at least never seen it. I'm testing out dialog as a replacement to the hand-coded menu I'm currently using, to reduce time spent tweaking. As for the sizing, thanks, I must have overlooked that part of the manpage. RankoKohime, In case you were wondering, You left a report for the moderators rather than replying. It looks like you did a good job of reposting the data pretty much verbatim. I did indeed. I realized that after submitting it. Either I need new glasses, or a custom CSS for this forum. Or probably both.